• Revolutionary ink system that starts quickly without dragging, requires minimal pressure from your hand and delivers crisp clean lines every time. • Rubberised triangular grip for comfort and control. • Transparent colour tinted barrel with metal clip. • Retractable tip for convenience. The PaperMate InkJoy system aims to put the joy back in writing with a unique and vivid low viscosity ink that flows easier for smooth writing with less drag. It also features a improved 1.0mm medium nib that delivers clear and crisp 0.7mm lines. The InkJoy 300 has a convenient retractable design, which helps prevent the ink drying out. The neat triangular shape provides extra comfort to your fingers and gives precise control for any kind of writing or drawing. 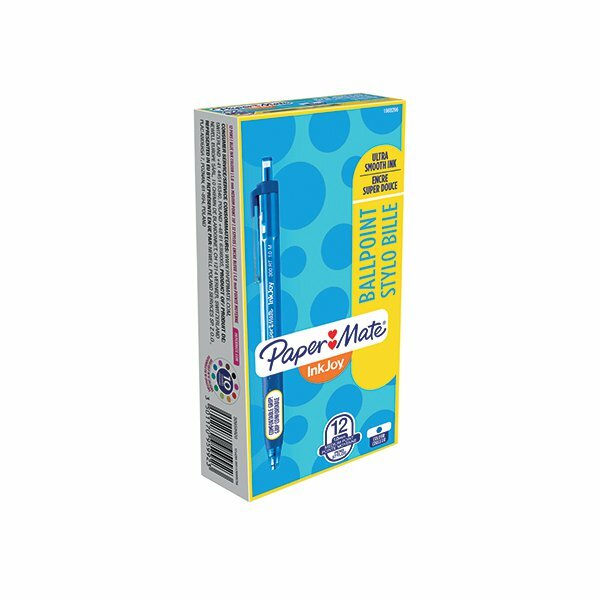 This pack contains 12 blue pens.